The world’s first national standard for engineering drawing was published in 1927 by the British Standards Institution (BSI). This was BS 308, which in one edition or another came to be found on the book shelves of almost every design, manufacturing and inspection department in the country. BS 308 was also widely used overseas, throughout the British Commonwealth. The standard was in use in India, Canada, Australia, New Zealand, parts of Africa, and many other countries. BS 308 was developed, revised and expanded over the years. Changes to the standard came about as it was extended to cover new areas, and to keep abreast of technological development and changes in working practice. In 1972, it was split into the three parts that many engineers and designers are familiar with. Meanwhile, ISO was developing international standards for engineering drawing and tolerancing. In a number of cases, ISO standards were developed to cover particular topics before any corresponding coverage was developed for BS 308. Rather than attempting to duplicate the ISO standard material in BS 308, these ISO were simply adopted as British Standards, and referenced by BS 308. By 2000, a complete set of British Standards for engineering drawing included around 30 ISO standards in addition to BS 308 itself. Many of these ISO standards were also being adopted by the European Union as ‘Euro Norm’ or EN standards. Once an ISO standard has been adopted by the European Union, it becomes an EN ISO standard; all member states (including the UK) then have a treaty obligation to adopt that standard at a national level (now it becomes a BS EN ISO standard in the UK), and to withdraw any other national standards which conflict with it. As a growing number of ISO standards were now becoming BS EN ISO standards, the risk of a conflict with BS 308 was also growing. Even if a conflict could be avoided, and BS 308 managed to stay fully harmonised with BS EN ISO standards, the outcome would simply be to have BS 308 and BS EN ISO standards duplicating each other. Eventually, the system of ISO standards became sufficiently comprehensive to cover every technical topic which was covered by BS 308. At best, BS 308 would now simply duplicate the ISO standards, and at worst, it would contradict them in some area; the justification for maintaining an independent British Standard for mechanical specification had now disappeared. The withdrawal of BS 308 took place in 2000. Designers and engineers now had to make use of the extensive catalogue of ISO standards that cover different aspects of Technical Product Specification. In order to make this transition as painless as possible, BSI produced a new document as an index to the ISO system, to help end-users find their way around it. This document is the standard known as BS 8888. BS 8888 got off to a very rocky start, as much of industry expected it to be a kind of new, improved BS 308, and instead, found that it consisted of little more than a long list of ISO standards, and gave virtually no guidance on how to produce a specification. Where BS 308 had provided guidance, explanations and examples on various topics, BS 8888 simply listed the ISO standards which now dealt with that topic. It was in effect just an expensive shopping list. In recent years, BSI have changed their approach to BS 8888. Instead of just listing the ISO standards which deal with a subject, BS 8888, in many areas, now reproduces much of the content of those ISO standards. The aim of the standard is no longer simply to index the ISO system, but also to make directly available much of the key material of the ISO standards directly, all in one place. The objective of the team responsible for BS 8888 is that 90% of the material that most engineers, designers and technicians require regular access to can be found directly within BS 8888. In this way, the standard seeks to make the ISO system much more accessible and far more useable. The first revision to take a major step in this direction was the 2013 revision. Work has recently finished on the next revision, which is now much more comprehensive, and will be published in December 2016. In some ways, BS 8888 has returned to its BS 308 roots, and is once again a document which provides rules, definitions and guidance for those involved in creating or interpreting technical specifications. BS 8888 - What does it mean in practice? The standards cover more than just engineering drawing, they cover all aspects of technical product specification, including, for instance, the use of 3D CAD models to define component geometry. The comma is to be used as a decimal marker instead of the full stop. Size tolerances should be interpreted in accordance with ISO 14405-1 (i.e. according to the Principle of Independency)*. This differs to their interpretation under BS 308, or the American ASME Y14.5 standard. The use of dimensions, size tolerances, datums, geometrical tolerances, edge and surface specifications have been formalised and systematised under the heading of Geometrical Product Specification (GPS). This approach is the driving philosophy behind BS 8888 and the current generation of ISO standards, and industry will potentially benefit enormously from its adoption. The benefits of standardisation became widely recognised during the industrial revolution. In the first quarter of the 20th century, national standards institutions started to appear to manage and advance this process in most of the major industrialized nations. 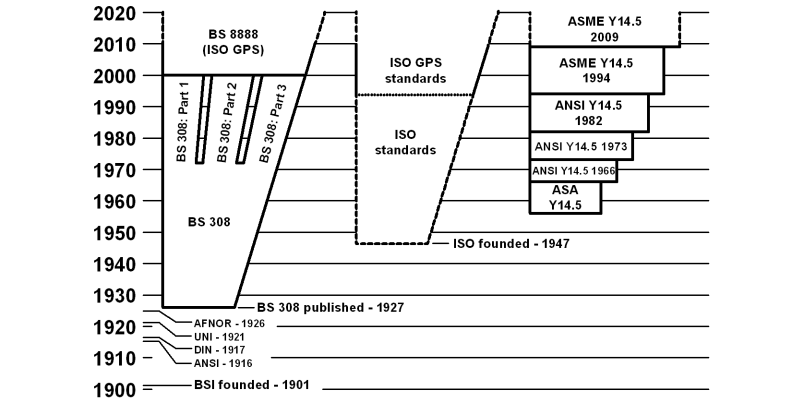 The British Standards Institute (BSI) was founded in 1901, the American National Standards Institute ANSI appeared in 1916 (initially as the American Standards Association, ASA), the German (DIN) in 1917, and the Italian (UNI) and French (AFNOR) equivalents appeared in 1921 and 1926 respectively. As industries developed to address global markets, and supplier bases expanded across national boundaries, the value of international standards, or at least harmonisation between national standards, became apparent. To address this need, a number of the major national standards bodies formed a federation known as the International Organization for Standardization. As the initials of this organisation could vary when the name was translated into different languages, the initials ISO were adopted as a universal acronym for its name. Membership of ISO is conducted through the national standards body representing any participating nation; so the United Kingdom membership of ISO is conducted through BSI. The federation has grown considerably since those early days, and now over 160 nations are represented in its membership. The standards which govern mechanical engineering specification have become rationalised over recent decades, and there are now two systems of standards which are used almost universally. These two systems are the American system, based around the ASME Y14.5 standard (GD&T), and the ISO system, known as Geometrical Product Specification (GPS), which is based on a number of interlinked ISO standards.